Another prime example of why truck drivers need to always be aware of the dangers of being alone on the road. 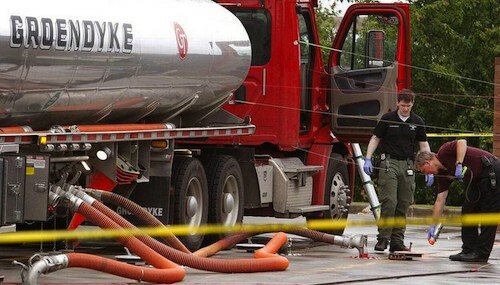 Early Thursday morning a Groendyke fuel truck driver was shot and killed outside of a convenience store in Fort Worth while simply doing his job. The tragic event has hit the company’s employees hard and they are devastated by his loss. The incident took place at a QuikTrip located on Bryant Irvin Road, in the southwestern part of Fort Worth, Texas. While it is still undetermined what exactly occurred, investigators say that the Groendyke fuel truck arrived at the store at about 1:30 a.m. Thursday morning and the driver had started unloading the fuel. Homicide detectives weren’t called to the scene until around 4:00 a.m. and aren’t yet sure exactly what time the shooting occurred, but they believe at some point before 2:30 a.m. the driver was shot while in the cab of his truck. Detectives found at least two bullets had hit the windshield. Interestingly enough the store had been open at the time of the shooting and people were even inside, but the store employees told police they didn’t see or hear anything out of the ordinary. It wasn’t until they came out to check on the truck driver that they found him dead and called the police. Thanks for posting this. Now they have the suspect..but there are more questions than answers! Wow! Thanks for sharing that. Sad that he took a life for no reason and now will basically loose his own life because of it. You mean he didn't realize he shot someone that night? Justice will be served. I grew up in springtown. Drugs is a huge problem in Parker County. Very sad, hope groendyke, and others will refuse to deliver fuel to that qt. Maybe then they will pay better attention to what goes on on the property. I live here Groendyke is a really good company that really does care for there drivers. Suspect is caught and has been arrested. This is sad. I guess you didn't read the last part of the article. And nobody heard or saw anything...brain dead deaf and dumb...WTF? Prayers to the Family, and Working Family. That's just sad.prayers to the family and friends.